The Terriers eked out a 2-1 win over the Riverhawks of UMass-Lowell tonight, needing some late heroics to do so. After the game remained scoreless well into the 3rd period, UMass-Lowell took the lead thanks to a goal by Joseph Pendenza. However, with less than 4 minutes remaining and BU with an extra attacker with a penalty pending to the Riverhawks, sophomore forward Alex Chiasson found the back of the net to knot the game at one goal apiece. Finally, with 27.5 seconds left in regulation, co-captain Chris Connolly (pictured) redirected a pass from fellow junior David Warsofsky to give the Terriers a late lead they would not relinquish. Grant Rollheiser got the start in net for tonight's game and played well, stopping 24 of the 25 shots he faced. BU's record is now 6-0-1 overall (4-0-1 in Hockey East). The Terriers' next opponent will be the Maine Black Bears, at Agganis Arena next Saturday. Fresh off his first goal of the season, Zach Cohen scored another goal tonight for Lake Erie in their 4-1 win over the Toronto Marlies. John Curry saved 30 of 32 shots in a 6-2 win over the defending AHL champion Hershey Bears to keep Wilkes-Barre Scranton's undefeated record intact. Brandon Yip notched an assist for the Avalanche in a 5-1 win over Columbus. 2011 recruit Cason Hohmann scored an assist in Cedar Rapids’ 3-2 win over Dubuque, extending his scoring streak to six game. He leads the Roughriders with 11 pints. 2011 recruit Matt O’Connor stopped 18 of 21 shots in Youngstown’s 3-2 OT loss to Des Moines. 2012 recrui Robert Polesello scored his six goal in ten games as the Vaughan Vipers beat Whitby, 4-1, in OPJHL play. Polesello was recently named to the Canada East team for next week’s World Junior A Challenge. Tonight will be the second game of the home-and-home series between Boston University and UMass-Lowell. After last night's 5-1 victory, the Terriers will host the Riverhawks at Agganis Arena at 7 pm, aiming to remain undefeated. Boston Hockey Blog will be blogging live during tonight's game. WZZN will broadcast tonight's game live with Bernie Corbett. The lady Terriers opened their conference play with a 2-2 tie at Providence. They will complete their home-and-home series with the Friars next Saturday at Walter Brown Arena. Five different Terriers found the back of the net and a total of 10 found the score sheet as BU powered past Lowell 5-1 as Tsongas Arena. Sophomore Alex Chaisson and freshman Sahir Gill scored shorthanded goals while Corey Trivino, Chris Connolly and Charlie Coyle had even strength scores. But it was goalie Kieran Millan (Millan) with 27 saves on 28 shots who earned the game’s first star as the junior netminder continued his strong play in goal. BU stymied Lowell on five power play attempts and has now killed 28 of their opponents last 29 man-advantage opportunities. For the season, Terriers have tallied one more shorthanded goal (four) than power plays goals allowed (three). BU improved to 5-0-1 and will meet Lowell again tomorrow at Agganis Arena. Former Terrier Zach Cohen scored his first goal of the season in AHL Lake Erie’s 6-3 loss to Manitoba. Brian Strait registered an assist on Wilkes Barre-Scranton’s first goal in a 4-1 route of Adirondack. Ryan Whitney scored his ninth assist of the season in Edmonton's 7-4 win against Chicago. Whitney leads the Oilers in scoring. 2011 recruit Cason Hohmann was all over the score sheet with four goals in Cedar Rapids’s 7-3 win again . Hohmann, who scored the game’s first three goals and later notched his fourth, now has seven markers in six games and is the league’s top goal scorer. In his first USHL season, he scored nine times in 58 games. Hohmann was assisted on his third goal by 2014 recruit Anthony DeAngelo, who has three points in four games. • News feature on DeAngelo. Fellow 2011 recruit Matt O’Connor stopped 40 of 42 Green Bay shots, but Youngstown was held off the score sheet and fell, 2-0. He has a 2.86 goals against average in nine games. Alex Privitera, the third member of BU’s 2011 recruit class, scored a power play goal for Muskegon, but the Lumberjacks lost in a shoot out to Des Moines, 4-3. The blueliner from Old Tappan, N.J., is currently the top-scoring defenseman in the USHL. BU continues with its conference schedule with a home-and-home series against Lowell beginning with a road game tonight at Tsongas Arena. The River Hawks will have plenty of new names in their lineup, having lost 11 players to graduation, including both goalies. Lowell, led by former BU associate head coach Blaise MacDonald, still has defenseman Maury Edwards and his heavy slapshot on the blueline. Tonight’s game will be the 80th meeting of the teams in conference play, with BU holding a 55-17-7 (.741) lead. Junior Andrew Glass (photo) scored a goal in BU’s 2-1 win over the Friars last Feb. 20, the Terrier’s only win against Providence last season. BU is expected to have the same lineup as last weekend with possibly a few tweaks made the forward lines. Junior Kieran Millan (3-0-1, 2.20) is scheduled to start in goal tonight. Check back for the lineup. • GoTerriers.com previews the game and has links to game notes, gametracker, the WZZN radio Webcast and a pay-per-view broadcast from B2TV. • The Boston Globe looks at defenseman Ryan Ruikka’s comeback from two seasons of injuries. • WTBU Game Center with a live blog and links to a weekend preview and live broadcast. • The Boston Hockey Blog live blog. The fifth-ranked women’s hockey team travels to Providence to take on the 6-2-0 Friars. BU has won only one of eight previous games at Schneider Arena. • GoTerriers.com has links to game notes, the WTBU Radio Webcast, pay-per-view TV Webcast, and gametracker. • The Daily Free Press previews tonight’s game and talks with Coach Brian Durocher about Providence Coach Bob Deraney whom he mentored as a BU goalie. The Boston Hockey community turned out last night to honor four recipients of the Lester Patrick Award, including veteran Terrier hockey coach Jack Parker. A three-time winner of the Spencer Penrose Memorial Trophy as NCAA Coach of the Year and the only NCAA hockey coach to earn 800 victories at one school, Parker was honored along with longtime rival and friend, BC Coach Jerry York, Bruins President Cam Neely and AHL President Dave Andrews at Boston’s TD Garden last night. Parker received his award from Toronto Maple Leafs President and general manage of the 2010 U.S. Olympic team Brian Burke. He is the face of a lot of the school -– certainly the athletic department and the hockey program…I kind of compare playing for him to what I've read and heard people say about playing for Bill Parcells," Drury said. "When you first play for him, you're scared to death of him. You think he's crazy – playing mind games. He's intimidating. You name it, he's doing it. But slowly, by the third or fourth year of playing for him, you're just afraid of letting him down. You learn why he does things. And you don't want to let him down because you love him so much…..
► One of the 57 Parker-coached Terriers to reach the NHL, Olympic hero Jim Craig, will handle the honorary dropping of the puck tomorrow night when BU faces off with UMass Lowell at Tsongas Arena. Craig is appearing in support of his nephew, Craig Charron, who recently passed away after a brave battle with stomach cancer and Charron's charitable foundation Sharky's Fight. Charron scored 148 points in 148 games for Lowell before beginning a 12 year pro career in which he was an AHL all-star three times. As Hockey Fights Cancer Month winds down, mlive.com profiles 2011 recruit Alexx Privitera, who recalls the grandfather who helped introduce him to hockey and later was a cancer victim. The 5-10 offensive defenseman leads the Muskegon Lumberjack in points with seven points in six games. 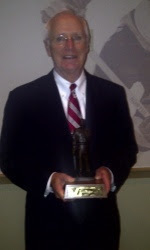 Coach Jack Parker will receive the Lester Patrick (photo) Award tonight at a dinner at TD Garden in Boston. The award is given annually to recognize an individual's contribution to hockey in the United States by the NHL and USA Hockey. Parker spoke with NHL.com’s Michael Blinn about his long coaching career and how it began with a favor done for a former Terrier teammate. The other award recipients are BC’s Jerry York, Bruins President Cam Neely and AHL President Dave Andrews. USCHO Hockey East blogger Dave Hendrickson reports on the Terriers’ return to college hockey’s top echelon, the strong work in goal they’re receiving from Kieran Millan and the role of a new defensive scheme—that yields more d-zone time, but fewer “grade A” shots—in BU’s early-season success. Freshman Sahir Gill, who leads the Terriers in both points and plus-minus is featured in this week’s “Hot List” from The Hockey News. 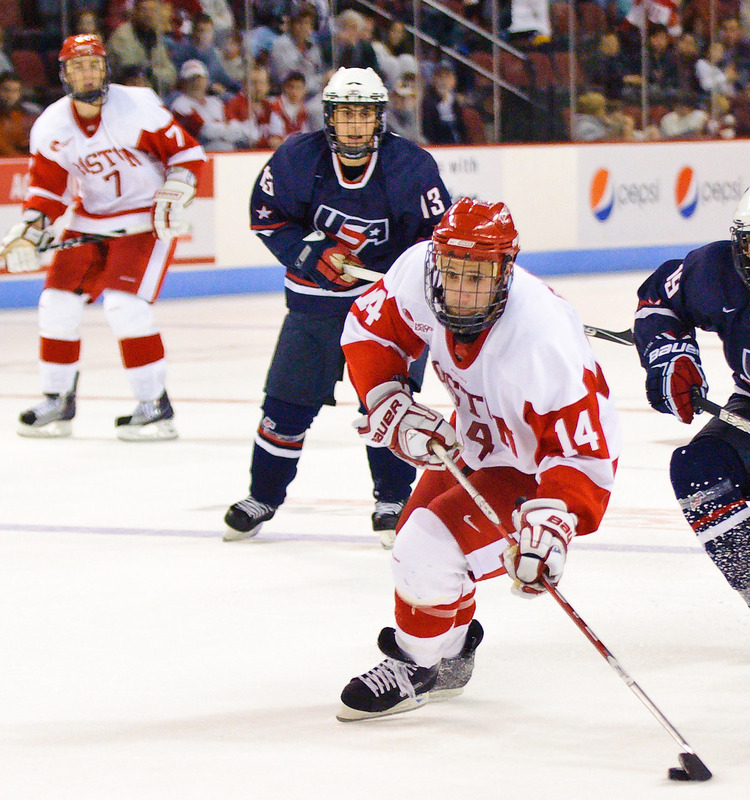 Scarlet Daily has another quiz to test your knowledge of BU hockey. We’re still looking for the correct answer from Monday’s trivia question. 2012 recruit Robert Polesello has been named to the Canada East squad for the World Junior A Challenge to be played in Penticton, B.C., Nov. 8-14. Polesello, a 5-7 forward who plays for the Vaughan Vipers in the OPJHL, is the youngest player on the Canada East squad. 2011 recruit Cason Hohmann was named to the U.S. squad for the tournament. U.S. Hockey Report says that BU is among five schools (also BC, Harvard, Michigan and Yale) being considered by Max Domi, one of the top ’94 prospects in Ontario. A playmaking center for the Dons Mills midget minor team, he is the son of former NHL enforcer Tie Domi. The BU Women's Hockey Team open's its defense of its Hockey East title with a home and home series against Providence this weekend. The Terriers, ranked 5th nationally with a 6-1 mark, travel to Providence Friday night and then meet the Friars at Walter Brown Arena on Saturday afternoon (3 p.m. start). The games will feature two former Terrier men's team goalies behind the respective benches: Brian Durocher for BU and Bob Deraney for Providence. Freshman goalie Kerrin Sperry, who raised her record to 5-0, was named to the Hockey East Online top performers list for the past week. Fellow freshman Marie-Philip Poulin is fourth in the nation in points per game with 2.29, while junior Tara Watchorn is the leader among defensemen with 1.57. Terriers are undefeated after five games at 4-0-1 and, despite all four wins being of the one-goal variety, those who vote in the polls are uniformly impressed. BU moved up two spots in the USCHO poll to 6th in the nation with two first-place votes. In the USA TODAY/USA Hockey Magazine poll, BU is 5th with one first-place vote, while the Terriers are 5th in the INCH power rankings. The Daily Free Press recaps BU’s 2-1 win against Providence and reports that freshman hard-luck Yasin Cissé’s ankle injury is more serious than originally believed and might require surgery. The Freep also revisits the milestone game for another hard-luck player, Ryan Ruikka, who, after two seasons lost to injuries, has grabbed a spot on the blueline and registered his first career points Saturday night. ►In Hockey East’s weekly release, Ruikka, Charlie Coyle, Alex Chiasson and Kieran Millan all made the list of top performers. The expanded release now includes national and conference scoring stats (begins on page 7). Sahir Gill is #7 nationally among freshman scorers and tops in Hockey East. David Warsofsky is tied for #9 nationally among defensemen and tied for #2 in the conference. ► USCHO recaps the weekend’s games in Hockey East. ►The Bruins Draft Watch Blog has Matt Nieto on its radar. Former Terrier forward and All-American Colin Wilson scored his second goal (video) of the season, which was the game-winner in the Predators’s 4-3 victory against Tampa Bay. ESPN-Boston presents a Q&A interview with former Terrier All-American defenseman Tom Poti now skating for the Washington Caps. [Coach Parker] taught me pretty much what I know today about playing defense, and he said my offense is going to get me there but my defense is going to keep me there. That was a good lesson. ►Terrier Trivia: Which two BU standouts represented the U.S. in the Winter Olympics before attending and playing for the Terriers? If you think you know the answer, put it in a comment. ► Today, Hohmann was named to the U.S. Junior Select team that will play in the World Junior A Challenge in British Columbia beginning Nov. 6. ► NHL.com’s Mike Morreale profiled the top pro prospects in the USHL this season, including 2011 BU recruit Alexx Privitera of Muskegon and NTDP U18 forward JT Miller who reportedly is on BU’s radar. UPDATE: Miller committed to North Dakota today. U.S. Hockey Report revealed that BU is pursuing several high-end prospects from Canadian Junior A and midget programs. Destry Straight (yup, his real name) is a ’93 left-shot center with the BCHL Coquitlam Express who has been burning up the BCHL in the early going. While many feel he’ll need a second year of junior hockey to fill out, BU, BC New Hampshire and Maine, along with several Western schools, already have Straight on their radar. Mike Matheson, a top ’94 defenseman, projected to be a first-round pick in the 2012 NHL draft, will visit BU next Saturday during the home game with Lowell. A 6-1, left-shot blueliner for the Lac St. Louis Lions of the Quebec Midget AAA league, he’ll be at BC the previous night. Two of Matheson’s Lions teammates, Anthony Duclair and Jonathan Drouin, both highly skilled ’95 forwards, visited BU last week and attended the home opener vs. UMass at Agganis Arena. Duclair recently had a nine-point weekend (7g, 2a in two games) for Lac St. Louis. BU has had recent success recruiting players from Quebec, with Chaisson and Cissé on the roster, while the women’s team is being led by Marie-Philip Poulin, also from La belle province. Despite being outshot 40-20 by Providence, BU earned a hard-fought 2-1 win over the Friars at Agganis Arena. Terriers’ scoring came from redshirt sophomore Ryan Ruikka (photo) and sophomore Alex Chiasson, each of whom had a goal and an assistant. For Ruikka, who missed the two previous seasons with injuries, it was his first career goal and first career point. Kieran Millan, who took home first star honors with 39 saves, only yielded an extra-attacker goal with eight seconds remaining in the game. BU killed all seven Providence power plays during which the Friars took 14 shots. Coach Jack Parker was pleased with the Terrier’s defensive effort pointing out that BU had blocked numerous shots and had limited the number of grade A scoring chances for Providence. In his post-game remarks (below) he discussed Ruikka's long comeback from injuries and his strong defensive effort in the games to date. There was a familiar face behind the Providence bench last night. Former Terrier standout Clark Donatelli is a volunteer assistant to Friars coach Tim Army. A 60-goal scorer with 135 career points as a Terrier, Donatelli played 35 NHL games with the North Stars and Bruins. His family's construction company built Schneider Arena and, according to urban legend, Clark was the first to skate on its rink as a teenager. John McCarthy, playing his ninth game for the Sharks, scored his first NHL goal in San Jose's 6-1 win over Edmonton. Late in the third period, McCarthy, positioned just outside the crease, backhanded a rebound (video) into the Oilers' net. Former BU All-American Mike Grier turned aggressive forechecking into primary assists on two Sabres goals at Buffalo ripped New Jersey, 6-1. Lots of BU alums in Wilkes Barre Saturday night as the Baby Penguins beat the Binghamton Senators, 2-1, in a shootout. Former Terrier MVP John Curry stopped 37 of 38 shots for the Pens. Brian Strait and Eric Gryba—teammates and roommates at BU—were on opposite bluelines. Neither participated in the shootout. A pair of ex-Terriers—who each played on NCAA title teams— were behind the benches, as well. John Hynes (1995 title team) is the Penguins head coach while Steve Stirling (1971) is a Senators assistant. Ryan Weston, who began the season with ECHL Las Vegas, has rejoined Phoenix’s AHL farm team in San Antonio where his reunited with his former Terrier teammate Pete MacArthur, who is in in his first year at San Antonio. 2011 recruit Alex Privitera had an assist and scored a shootout goal for Muskegon in its 5-4 shootout win over Indiana in USHL play. 2013 recruit Adam Erne had a shootout goal for Indiana. Youngstown goalie Matt O'Connor thought he'd have a night off, but was called upon for a relief effort in the Phantoms' 4-1 loss to Dubuque. O'Connor stopped all 14 shots he faced. •Go Terriers.com recap and comprehensive box score. BU will complete its first weekend of two conference games with tonight's matchup against Providence College. Terriers dropped two of three meetings with the Friars last season, but have won nine of the last twelve meetings and own a 97-51-12 (.644) advantage in the all-time series. GoTerriers.com has links to game notes, game tracker, the All-Access Webcast and the WWZN Radio Webcast. Boston Hockey Blog is live-blogging tonight. Has already begun. ► One more recap of last night's win over UMass from Inside Hockey. ► Women's team won its sixth straight, topping Clarkson, 3-2. Details in next post. With goals from four different forwards, the Terriers held off a persistant UMass team for their third one-goal win in four games, 4-3. BU had opened up a 3-1 lead after two on co-captain Joe Pereira’s breakaway goal—his team-leading fourth of the season—off a Chris Connolly feed. Sahir Gill's steal and late goal extended the lead before UMass closed the gap in the final half minute. Charlie Coyle got BU on the board early in the second period and Andrew Glass (photo) scored his first of the season to give BU a lead it would not relinquish. Kieran Millan stopped 23 shots to earn his second win of the season. BU took 37 shots while holding the Minutemen to 26 shots, which Coach Jack Parker pointed out was indicative of BU's strong effort on the road. Co-captain Connolly, who assisted on two goals, in now playing the point on power plays with Wade Megan joining Coyle and Pereira on the first power play unit. ► At 3-0-1, BU is off to its best start since 2001-02 when the Terriers opened with a 6-0-1 mark. ► Gill is BU’s scoring leader with 2-4-6 and the plus-minus leader with +6. His two goals have come on just six shots for a gaudy .333 shooting percentage. ► Pereira earned the game's #1 star; Connolly, #3. ► The crowd of 7,021 set a home-opening record for the Mullins Center. Tonight the Terriers host Providence College which lost in overtime to UMass-Lowell last night, 5-4. Check back later for pre-game information and more coverage. •Boston Hockey Blog recap and feature on the revamped 3rd and 4th lines, each of which contributed a goal. 2011 recruit Cason Hohmann second his second goal of the season in Cedar Rapids’ 3-2 loss to Chicago. The Texas native leads the first-place RoughRiders in scoring with six points. The Terrier Women’s team extended its winning streak with a hard-earned 2-1 win over St. Lawrence at Walter Brown Arena. Jenn Wakefield’s second period shorthanded goal proved to be the difference when the Saints scored in the final minutes of the third period. Louise Warren had the other goal for BU, which takes on Clarkson Saturday. • GoTerriers.com recap with links to video highlights and Coach Brian Durocher's post-game comments. The Terriers are on the road today for their second consecutive game against Don Cahoon’s Minutemen. The game will be the 50th Hockey East game between BU and UMass with the Terriers holding a 37-8-4 edge. The 7 p.m. start will air on NESN. BU, looking for its first conference win, is likely to see freshman Jeff Teglia again in the UMass net. The Daily Free Press previews tonight’s game reporting that there will be some new defense pairings. Kieran Millan gets the start in goal. GoTerriers.com has game notes and links to gametracker and the radio Webcast on WWZN. Scott McLaughlin and the Boston Hockey Blog crew will be live-blogging tonight from the Mullins Center in Amherst. Scarlet Daily feature on co-captain Joe Pereira (photo) . HockeyEastOnline previews this week’s games involving conference teams while USCHO’s Hockey East blog makes its picks for those games. The Boston Globe Hockey East Notebook. With four members of the Class of 2011 having made early departures to the professional ranks, Periera and backup goalie Adam Krause, the two remaning seniors, talk about their leadership roles and what they’ve learned from previous years' upperclassmen. Canada’s popular Pipeline Show has a blogpost on the Top 5 Canadian freshman in NCAA Hockey and Sahir Gill is on the list along with his former Vernon Viper linemates, Connor Jones and Kellen Jones, playing for Quinnipiac. Thursday’s edition of BU All Access with Brian Maurer and Bernie Corbett featured an interview with junior forward Corey Trivino. (about 20 min. into the show). Inside College Hockey’s latest power rankings have the Terriers at #9. Former Terrier co-captain John McCarthy picked up his first career NHL point last night, a first-period assist in San Jose’s 4-2 win against Colorado. 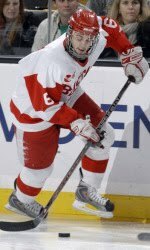 McCarthy was facing his one-time BU linemate Brandon Yip of the Avs. Rick DiPietro stopped 28 of 30 shots in the Islanders’ 3-2 overtime win against Tampa Bay. The Syracuse Post-Standard reports that Nick Bonino of the Syracuse Crunch continues to stand out both on and off the ice. News stories about the influx of Californians into college hockey invariably mention players having started out playing roller hockey. Case in point is freshman Matt Nieto from Long Beach. But the phenomenon isn’t limited to the West Coast. 2011 recruit Alexx Privitera, from Old Tappen, N.J., also started out on wheels and eventually won a gold medal at the North American Roller Hockey Championships. Details on his transition to ice and strong start with USHL/Muskegon from the Lumbjacks’ Web site. The fifth ranked BU Women’s team hosts St. Lawrence and Clarkson for a pair of non-conference games on Friday evening and Saturday afternoon. Coach Brian Durocher previews the games in a video interview. GoTerriers.com has links to game notes, gametrackers, radio Webcasts and video Webcasts on All-Access. ►The season has been underway for two weeks, but we have one more Terrier hockey preview, this one from College Hockey News. ►NHL.com, previewing potential top choices for next June's entry draft, talked with freshman Adam Clendening who explains what areas of his game he's looking to improve and his decision to play college hockey rather than Major Junior. In its October ranking of draft prospects, International Scouting Services has Clendening at #17 and fellow freshman Matt Nieto at #22. ► Last night Versus aired a special marking the 15th anniversary of Travis Roy's spinal cord injury eleven seconds into his first college game and tracing the 15 years since as Roy has become a motivational speaker and advocate and fundraiser for spinal cord accident victims. Since 1997 the Travis Roy Foundation has distributed more than $2.5 million in individual grants and to research projects and rehabilitation institutions across North America. USCHO reports that the segment included never-before-seen footage of that night (Oct. 20, 1995, North Dakota at BU) and will have interviews from Roy and his family, BU coach Jack Parker and former teammate and current New York Rangers captain Chris Drury. ►Ticket information for the Lester Patrick Award dinner on Oct. 27 at TD Garden where Coach Parker will be among the honorees. Mile High Hockey reports that former Terrier forward David Van der Gulik has been recalled from Lake Erie by the Colorado Avalanche. MHH, whose report includes a photo of VDG and Brad Zancanaro with the Beanpot Trophy following BU's 2006 win, points out: "And imagine this: he once played for Boston University, the unofficial farm team of the Avalanche." Van der Gulik played six NHL games with Calgary during the 2008-09 season. It's pretty much a given that the hockey community will always rally to support a member in distress. So, it's no surprise that teams from the college and pro ranks have responded with contributions for an auction this Sunday to benefit Minnesota-Duluth equipment manager Chris Garner who is battling MDS (Myelodysplatic Syndrome), formerly known as pre-leukemia. Garner is awaiting a potentially life-saving bone marrow transplant. Merrimack Warrior and Eagle Tribune blogger Mike McMahon has the details, a list of all auction items--including a scarlet Terrier jersey--and a video. Hockey East named Marie-Philip Poulin its Pure Hockey Player of the Week. The freshman from Quebec scored four goals in last Friday's win against Wayne State and added two assists the next day as BU completed the weekend sweep of the Warriors. New England Hockey Journal also named Poulin its player of the week and talked with Coach Brian Durocher about the decision to keep Poulin and junior transfer Jenn Wakefield on separate lines. While the Terrier offense has made plenty of noise, The Daily Free Press points out the team's strength in goal with freshman Kerrin Sperry and sophomore Alissa Fromkin. The Daily Free Press’s Sam Dykstra examines one of two controversial calls during Saturday’s 2-2 tie with UMass that didn’t go the Terrers’ way. Should freshman Matt Nieto, who scored the game's first goal, have been awarded a penalty shot in the final seconds of overtime ? Watch the video and judge for yourself. For the second time in three games, BU had a decided advantage on faceoffs, winning 43 of 69 draws Saturday night. Corey Trivino (photo), playing his first game since February 13, was 12-5 on draws, while Wade Megan went 12-5 and Charlie Coyle, 14-9. Despite the tie, BU rose to #8 in the USCHO weekly poll as Denver and Maine dropped from the top ten. USCHO’s Hockey East columnist Dave Hendrickson recaps the weekend’s results for conference teams. They’ll likely be Terrier teammates in a few years, but Cedar Rapids’ Cason Hohmann and Anthony DeAngelo weren’t putting out the welcome mat for Youngstown Phantoms goalie and 2011 recruit Matt O’Connor in Sunday’s 5-2 win by the Rough Riders. Hohmann scored the first goal, then DeAngelo, making just his second start, got the second one and assisted on the third. Hohmann assisted on the fourth. (Video of Hohmann's first goal of the season vs. Fargo, 10/9). O’Connor had won four of five starts for the Phantoms including Saturday night’s 3-2 win over Green Bay when he stopped 23 of 25 shots. DeAngelo, a 2114 recruit, is the youngest player in the USHL and will celebrate his 15th birthday next Sunday. Another 2011 recruit, defenseman Alexx Privitera, had a pair of assists in Muskegon’s first-ever USHL win, a 6-0 shutout of Sioux City. Privitera leads the Lumberjacks in scoring with a 1-5-6 line. New England Hockey Journal caught up with the Predators’ Colin Wilson, who turns 21 this Wednesday, for a Q&A about his off-ice activities. John Curry picked up his second win in as many starts as Wilkes Barre/Scranton’s beat Charlotte, 4-3, in AHL play. Brian Strait has a team-leading +4 for the Baby Pens. Chris Higgins, playing for Ritten-Renon of Italy's Series-A hockey league, has eight points in as many games. The Terrier women clanged iron three times before finding the net en route to a 4-1 win over Wayne State in a game not nearly as close as the score indicates. Led by Jenelle Kohanchuk’s goal and assist, BU outshot the Warriors 44-25. Link to video highlights, box score and post-game interviews. In today's USCHO Division 1 poll, the Terrier women moved up a notch from sixth to five place. The Terriers opened up a 2-0 lead in the first period thanks to strikes from freshman Matt Nieto (first as a Terrier) and junior co-captain Chris Connolly, but were unable to retain the lead as UMass came back to tie up the game with two goals of their own in the third period. Nieto's goal was a one-timer in the slot off a feed from Corey Trivino from behind the net, while Connolly's came on a wrister from the right circle. Matt Nieto had a breakaway chance in the dying moments of overtime, but couldn't cash in as BU settled for a tie. Kieran Millan made the start and had 28 saves. The first goal allowed, scored by UMass defenseman Darren Rowe, came on an apparent deflection in front, while the second goal came as a result of blown coverage that left a man alone in front. Freshman goaltender Jeff Teglia played well for UMass, saving 33 of 35 shots as the BU outshot the Minutemen. Two future Terriers faced off in USHL play last night, as the Cason Hohmann's Cedar Rapids Roughriders defeated Adam Erne's Indiana Ice, 4-1. Hohmann tallied two assists in the game, while Erne scored the lone goal for the Ice. Tonight the Terriers will open their home slate against Hockey East foe UMass-Amherst. BU, 2-0-0 after it's IceBreaker championship, will face a Minutemen team that was swept last weekend at the hands of Minnesota. This begins a week long home-and-home series, as the Terriers will visit Mullins Arena next Friday. BU went 2-1 against UMass last season, with both victories coming at Agganis Arena. 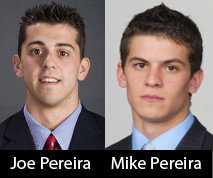 This game will also feature a fraternal battle, as senior co-captain Joe Pereira will skate against his younger brother Mike Pereira, a freshman forward with the Minutemen (pictured). As mentioned in the last post, the lady Terriers had a successful home opener last night, raising a few banners before their 7-2 win over Wayne State (highlights). Below are some photos of the ceremony last night (credit to Chris Henes). Following the lead of Big Ten schools, BU has discontinued printed media guides. Replacing them is an online “Virtual Guide” with 55 double pages of information including schedule, roster, season preview, team and individual records and more. Links to videos, including an interview with Coach Jack Parker, will be added soon. Click here to access it or use the link in the sidebar. Another new addition to the sidebar is a link to the College Hockey Inc. Web site. CHI is the new marketing initiative for college hockey announced last year by the NCAA Division 1 league commissioners and headed by Paul Kelly, the former Executive Director of the National Hockey League Players’ Association. USCHO’s Jim Connelly and Dave Hendrickson have made their picks for this week’s Hockey East games. The December 11 matchup with RPI in Troy, NY, will be played at 3:30 p.m. to accommodate a live television broadcast on Time Warner Cable Sports that also will air on the NHL Network. Thanks to one of our readers, we have a link to video of Kevin Shattenkirk’s shootout goal that clinched Lake Erie’s 2-1 win against Syracuse last Saturday. Former Terrier All-American and U.S. Olympian Jack Garrity will be inducted into the Massachusetts Hockey Hall of Fame on Nov. 10. The ceremony will be emceed by Bernie Corbett, the radio voice of Boston University men’s hockey, whose latest book is a history of the New York Football Giants. The Terrier Women’s team began the evening celebrating the 2010 Hockey East title banner raising and gave their fans more to celebrate the rest of the night, scorching Wayne State 7-2. Freshman sensation Marie-Philip Poulin (see the BU Today feature in this morning’s post), made her Walter Brown Arena debut a memorable one with four goals, including three in a row for BU at one point. She has eight goals in four games. Freshman goalie Kerrin Sperry won for the second time this season. • Video highlights on BU All-Access. • Coach Brian Durocher comments. Following last weekend’s successes in the Icebreaker Tournament, the Terriers will add some reinforcements to a forward corps that produced nine goals in its first two games. Junior center Corey Trivino (photo)and sophomore wing Alex Chiasson return from two-game suspensions due to violations of team rules. The Daily Free Press reports that the pair will skate together in tomorrow’s home opener against UMass, possibly with freshman Matt Nieto on left wing. Another lineup change would move freshman Sahir Gill, who was Hockey East’s Rookie of the Week, to right wing on a line centered by sophomore Wade Megan. ► Nieto was ranked third among first-year college forwards in Inside College Hockey’s annual recruiting report. Charlie Coyle was ranked third, while Adam Clendening was rated #2 among blueliners. Overall, INCH rated BU’s recruit class third, behind Denver and Notre Dame. ► Nieto talked about his goals for the season and the player he emulates in a Q&A interview. ► GoTerriers.com’s new Daily Scarlet feature offers an anagram puzzle with the names of former Terrier captains and a preview of the weekend’s BU sports schedule presented by sophomore Sean Escobedo and women’s team junior Carly Warren. ► USCHO Hockey East columnist Jim Connelly has some thoughts about the short time from from first practice to first game and about BU’s initial games. ► The UMass Daily Collegian explains why the Minutemen’s power play was so effective last weekend against Minnesota. ►The Boston Globe’s Nancy Marrapese-Burrell talks with College Hockey Inc. director Paul Kelly about the dual challenges of competing for players with Canadian major junior leagues and limiting defections to the NHL. The Terrier Women’s team has its home opener tonight vs. Wayne State and, during opening ceremonies, will raise the Hockey East championship banner. The two-game series with the Warriors concludes with a 2 p.m. matinee tomorrow. The Daily Free Press previews the series. BU Today looks at three newcomers to the women's program--Marie-Philip Poulin and Catherine Ward, who played for the 2010 Canadian Olympic team, and transfer Jenn Wakefield, a member of the Canadian National team--and discussed their potential impact with Coach Brian Durocher in a video clip. A USCHO poster pulled a real gem out of the Life Magazine archives on the Internet. Nearly sixty years ago, the Jan. 22, 1951 issue included a photo feature on a series of college games at Boston Arena, now Matthews Arena. It brought together the four teams that had competed in the previous season’s NCAA tournament—BU, BC, Colorado College and Michigan—which the Wolverines won. The article's focus was on BU’s standout forward Jack Garrity who had led the nation in scored as a freshman with 51-33-84. 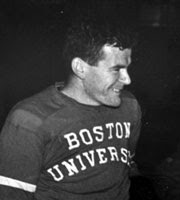 The first night, Garrity, a BU Hall of Famer who played in the 1948 Olympics prior to attending BU, scored twice as the Terriers avenged the previous season’s loss to the Tigers with a 7-4 win. Michigan edged the Terriers, 3-2, two nights later. BU fans may recall that at the 2009 Frozen Four in Washington, D.C., Jack Parker had Garrity, then 83, fly up from Florida to address his team. Check Parker's comment to Chris Drury about Garrity in this New York Times blog post. ► College Hockey News named the Terriers Team of the Week for their efforts in the Ice Breaker. Luke Popko, a defensive standout for BU the past four seasons, has signed on with the Ontario (Calif.) Reign, the ECHL affiliate of the Los Angeles Kings. Nick Bonino, who suffered a mild concussion last Friday night against Lake Erie, skated in practice for Syracuse today and expects to be in the Crunch lineup Friday against Adirondack. Colin Wilson notched his first goal (video) of the season in Nashville’s 3-2 win against the Blackhawks. 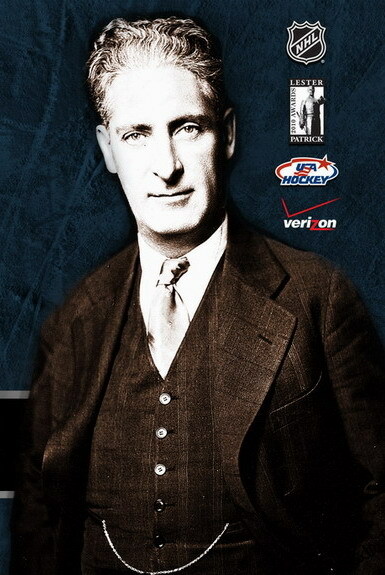 GreatestHockeyLegends.com posted a bio of Wilson's grandfather, Jerry, also a 6-2 center, who had a brief NHL career with the Canadians before injuries forced his retirement. He later went to medical school, became an orthopedist and was named team physician for the Winnipeg Jets. Colin's father, Carey, also was an NHL player and Canadian Olympian.